It's hard to believe the summer is coming to a close, especially as Michigan is treated with an extraordinarily warm finale for this Labor Day weekend. Although, predictably for Michigan, today's humid, tropic 90's will make way for more seasonal fall weather to usher in the first day of school, as if Mother Nature intends to help the students settle into their new routine. While I will miss our warm days, spent around the pool with family and friends, I do enjoy the fresh, clean, crisp fall days. One of the ways my family stays connected during the busy school year is through our love of football. For my team, fall, family and football are synonymous. From weekday evening practices, to Friday nights in the high school stadium, Saturday morning games and Sunday afternoon family room huddles, football rules our fall schedule. My daughter supports her high school team as a member of the marching band flag corps. Watching her from the stadium stands not only brings more excitement to the game, but also brings back my memories of marching in high school and college. My son is now in his second year of junior football (starting offensive tackle!) which means my husband is having a blast, bonding with the other football dads, reliving their glory days and doing a fair amount of sideline coaching! With all this hustle and football bustle, you might think we had our fill - not even close! My team is devoted to watching college ball, whether live or at home, although those games can sometimes be counter-productive to bonding as we are a collegiately-divided family, with fans of the Spartan and Wolverine rivals both in our ranks! Fortunately, while watching pro football games can get fairly rowdy, at least my football fans are on the same team! while I love watching my son play football and enjoy live football, watching football games on tv is not my favorite past time, primarily due to the non stop commentary and frequent breaks in play. 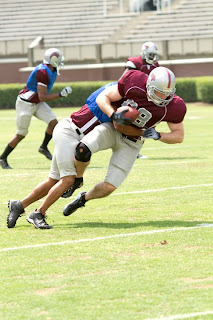 I do, however, adore football movies! Fortunately, so does the rest of my team! All of our favorite football action, minus the irritating distractions, plus an interesting plot! 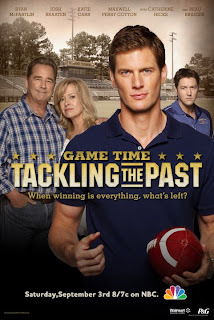 I was thrilled to be given an opportunity to get a sneak peak at the latest offering from the Walmart and Procter&Gamble Family Movie Night series ~ Game Time: Tackling The Past! Walmart and P&G have been offering families quality entertainment via this special collection to promote family bonding without worry about inappropriate content or commercials. Created especially to offer something for everyone, previous releases of Family Movie Night films, such as The Jensen Project and Who Is Simon Miller?, have been extremely well received. 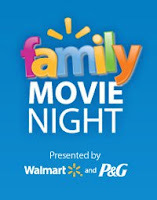 Take a refreshing break with your family from back to school preparations this Labor Day weekend with Family Movie Night! Gather your team, grab some popcorn and tuck in for a fantastic evening of quality entertainment tomorrow evening, September 3rd, at 8/7c on NBC to watch Game Time: Tackling The Past. "It's one thing to look like a good man and another to actually be one." Game Time: Tackling The Past takes viewers along a man's journey of re-evaluating what is truly important and meaningful in his life. Jake Walker, a pro football star near the pinnacle of his game and nearing an all time record takes an emotional and reflective journey back to the family and home town he left behind on his way to the top. 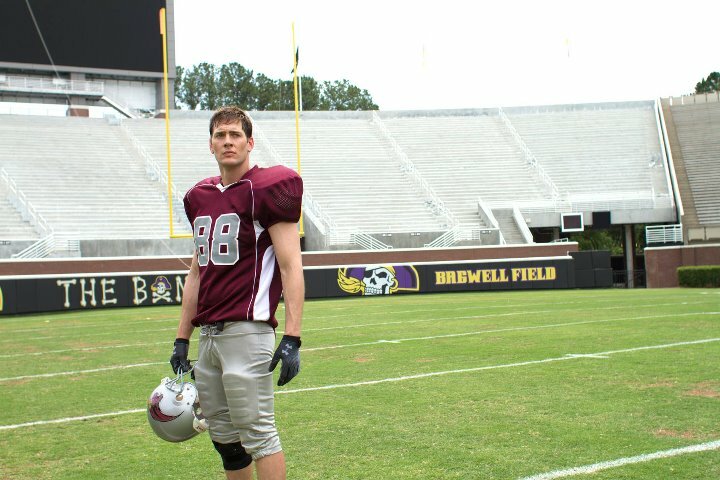 While reconnecting with his family and friends, he faces his father's medical crisis, both a blow and an attractive opportunity in his pro football career. Jake struggles with making a decision that will determine the path of both his career and life. I found Game Time: Tackling The Past to be both engaging and thought-provoking and I am looking forward to sharing it with my family tomorrow, Saturday, Sept 3rd at 8/7c on NBC. While I know they will enjoy the football action, the story line will open the door to important conversations on the topic of life paths and future choices ~ one of those important conversations that do not often happen without inspiration. Any time your family has an open ended, introspective conversation, it is a win-win for your "team". 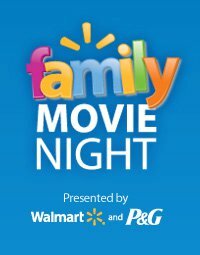 Take a time out with your team this Labor Day weekend for an entertaining and enriching evening with Walmart and Procter & Gamble's Family Movie Night, Saturday, September 3rd, at 8pm EST/7pm CST on NBC. I wrote this review while participating in a campaign by Mom Central Consulting on behalf of P&G and received a promotional item to thank me for taking the time to participate. The opinions above are both honest and my own. Images sourced from various Family Movie Night sites. My son loves football & we cannot wait to watch this! I love football movies and tv too! I thought I was the only one. NanaHood "likes" you, follows you on twitter and your blog via GFC. Blessings to you and your football family. We are a basketball family...our twins are 6 foot 8! I love love love football and I have seen some awesome football movies. Stopping by from the Say Hi Sunday Blog hop! it was a great movie! I just hate that it started so late because of the football game...LOL How ironic! Sounds like I missed a good movie! Thanks for hopping by! I'm happily returning the follow on Twitter, GFC and LIKE on Facebook! I Wasn't able to watch it because I was out with family...maybe it will be on again soon?? I really enjoyed this - what a sweet family movie.